område og fra de skandinaviske lande. • At præsentere aktuelle grønlandsmedicinske forskningsresultater. forebyggelse og sundhedsfremme.The Danish Greenlandic Society for Circumpolar Health, Peqqissaasut Kattuffiat (The Greenlandic Nurses Association), The Physicinas Assocciation of Greenland and Greenland Institute of Health Research has the pleasure to invite to the 9th NUNA MED – a conference on medicine and health in GReenland. The Danish Greenlandic Society for Circumpolar Health (Grønlandmedicinsk Selskab), Peqqissaasut Kattuffiat (Grønlands Sygeplejeorganisation), Grønlands Lægekredsforening og Greenland Center for Health Research has the pleasure to invite you to the 10th NUNAMED – a Conference on Medicine and Health in Greenland, October 5 – 7, 2019, in Nuuk. Since 1991 the NUNAMED conferences have been arranged aproximately every third year in Nuuk with 200-250 participants, mainly from Greenland and Denmark. In 2003 NUNAMED was arranged as part of the ICCH12 congress with participants from all of the Arctic area and and from the Scandinavian countries. Since 2003 the number of participants from countries other than Greenland and Denmark has increased. an increasing number of participants have come from other countries Please see the history page (in Danish) for an overview of the history of the NUNAMED conferences. To present current research results related to health in Greenland. To debate current research questions related to health in Greenland across the health disciplines. To improve collaboration on health research in Greenland between the health disciplines and between health districts. We hope that the number of participants at NUNA MED 2019 will be as high or higher than at earlier NUNAMED conferences. There is still a need for strengthening of health research in Greenland to improve treatment, prevention and health promotion. In attachment to NUNAMED 2019 research courses on PhD and Master levels will be held October 2 – 4, 2019. Further information will follow. For junior researchers living in Denmark a presentation competition will be held April 2019. The best presentation will be awarded with participation in NUNAMED 2019. Abstract submission deadline is August 15, 2019. 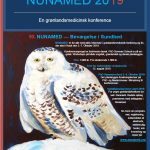 NUNAMED takes place October 5 – 7, 2019, in Nuuk.